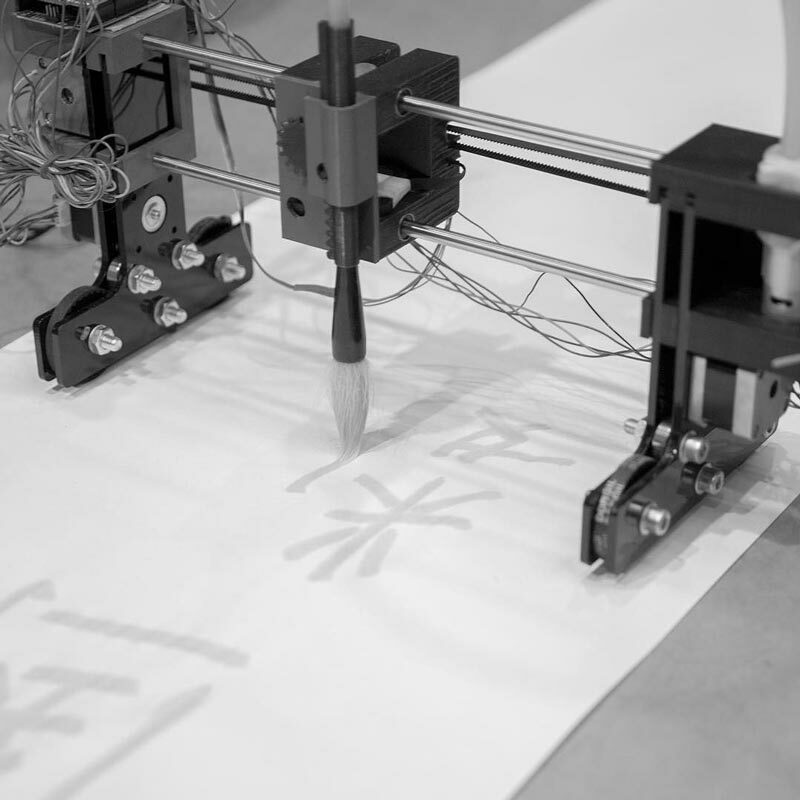 dìshūBot is a water calligraphy device inspired by the modern Chinese custom of painting calligraphy on public sidewalks with a water brush, a “practice [that] corresponds to both a socializing need and an individual search for self accomplishment or improvement” (Francois Chastanet). Fabricated at FablabO in Shanghai as part of the 2017 Fab Academy session, dìshūBot is a composition of 3D printed and laser cut materials and employs a combination of stepper motors, a water pump, Arduino Uno x CNC Shield and a custom G-code transcoder (Grasshopper) to endlessly trace passages composed of «hanzi» that slowly disappear as water evaporates. Mentorship, technical expertise, heart, limitless hours given by Saverio Silli. Project developed in FablabO, directed by Junfeng Ding, at beautiful Tongji University in Shanghai, China. Additional support from the open-source community and local collaborators ZhaoWei Hu & Carmen Maria Arnalot. Thank you. 2017 Fab Academy led by Neil Gershenfeld. Fab academy is a globally distributed educational model teaching people to turn code into things. In this post, I will explore some precedent and the prototyping of mechanical design and fabrication from my point of view. The collective effort of the project will be posted to a Shanghai fabpage. Because it is fun to skip to the end of the story first (SPOILER ALERT), this is a video of a working prototype of dishuBot featured at Maker Faire Bay Area 2017 writing a poem by Tao Qian titled Drinking Wine.